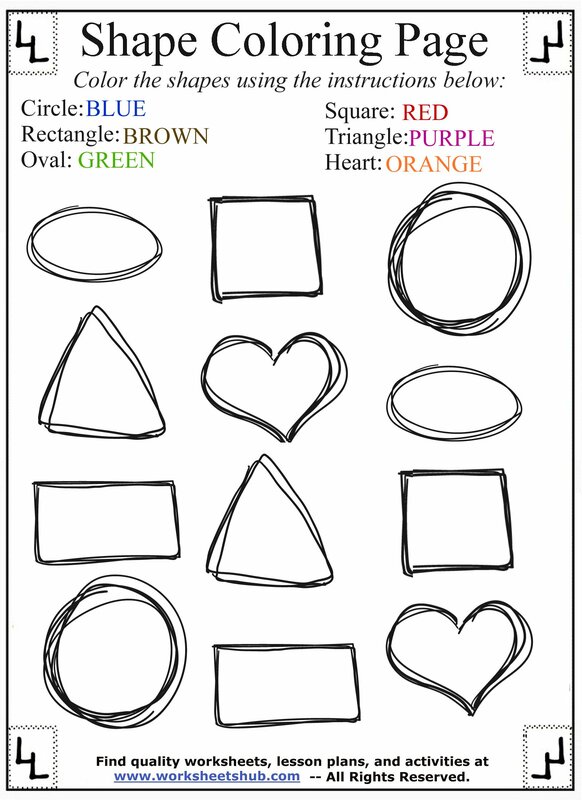 These basic shape coloring pages are a great way to introduce shapes to your Preschooler or Kindergartener. 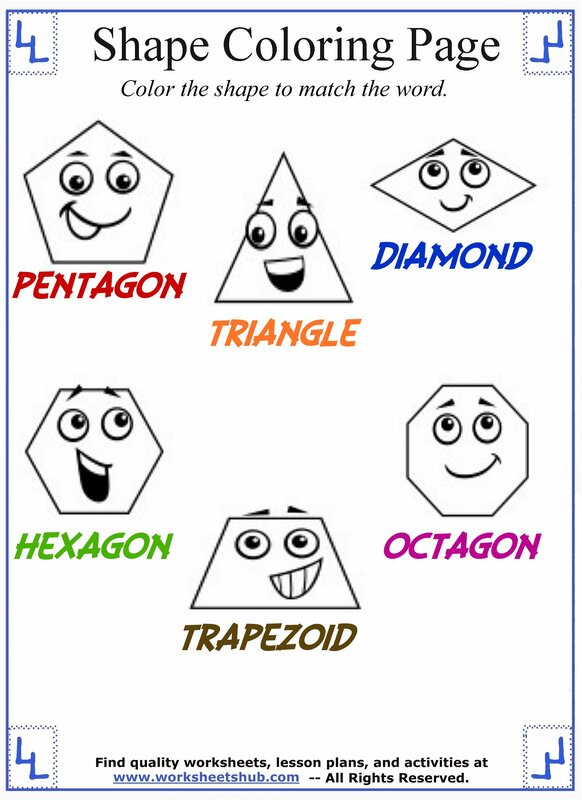 For slightly older students, there are geometrical shapes that are usually introduced in 1st Grade and then expounded upon in later school work, such as the hexagon, pentagon, and other shapes. 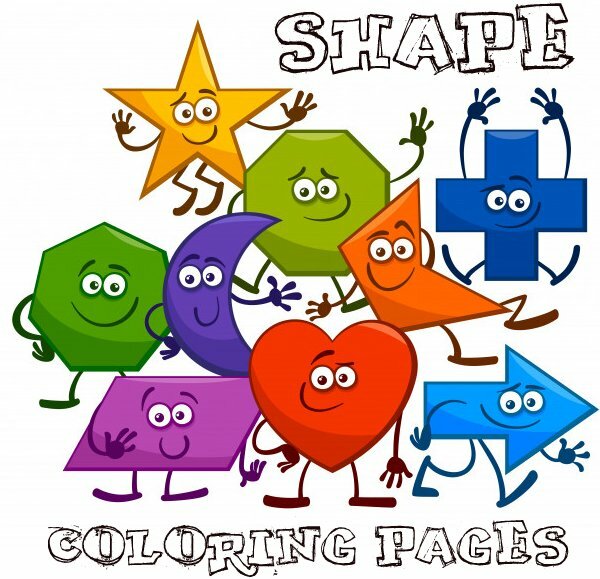 These coloring pages will introduce shapes and their names to your child and the short activities will help to reinforce both the shape and its name while your child colors. The worksheets below all have instructions on them, but I'll cover them in more detail below if you find yourself needing help knowing what to do. Otherwise, just click a picture to open your printable PDF file. Feel free to use these in the classroom or at home for personal use. 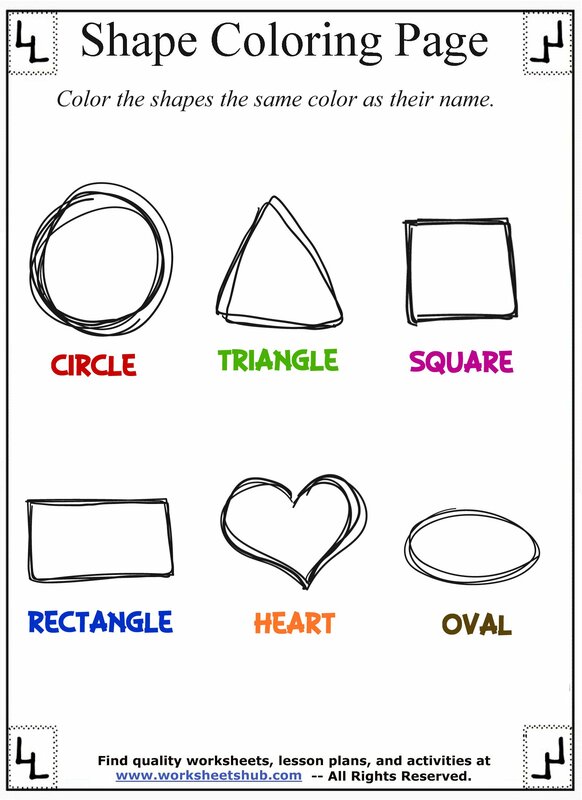 In the first worksheet, your child will be presented six different shapes. Below each shape is the name. The names are all written in different colors. Have your child color the shape the same color that the name is written in. For example, the word "circle" is written in red, so your child would need to color the circle red. The next worksheet uses the same basic concept, except instead of shapes with names below them, there are many shapes with a coloring key code at the top of the page. 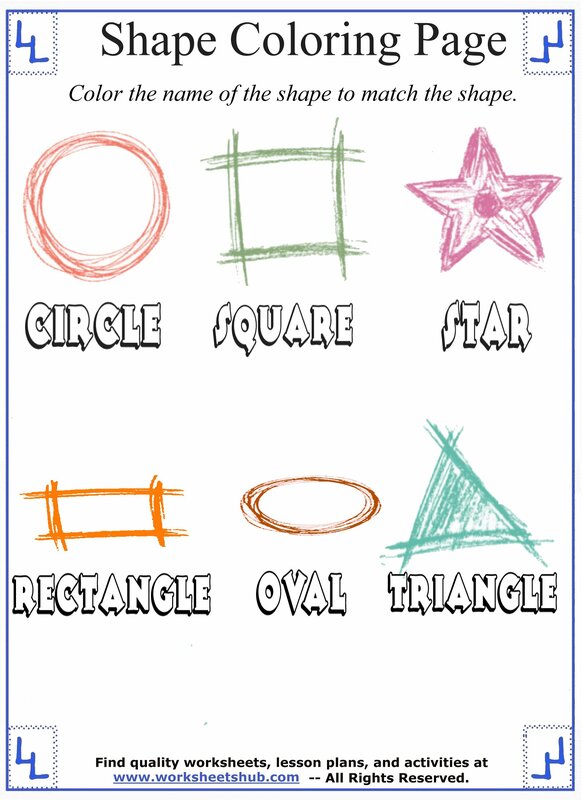 Following the key code, your students will need to color in the shapes. The third printable shows six different shapes again. This time, instead of the shape names being colored, the shape is color. Have your child color in the shape name to match the color that the shape is drawn in. 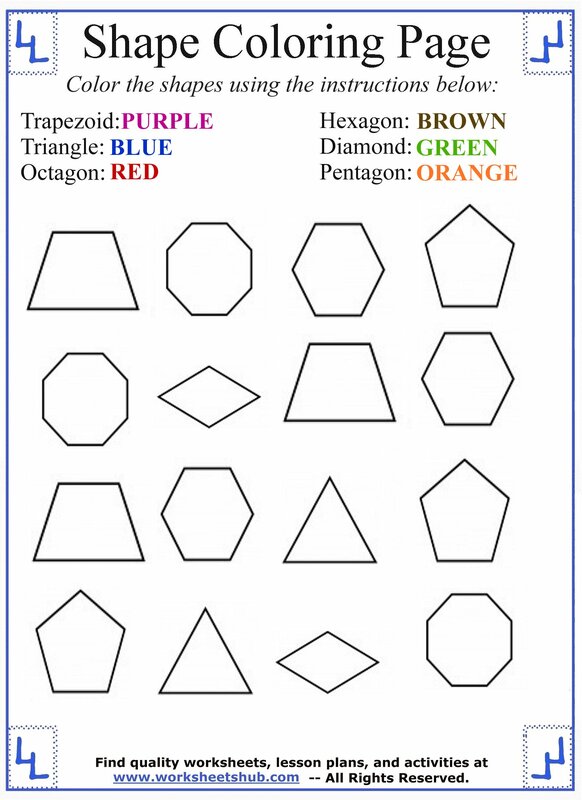 The next three shape coloring pages deal with more advanced shapes like octagons, hexagons, and trapezoids to name a few. The instructions will closely follow the format of the ones before. In the fourth paper, six new shapes are introduced. Below each shape is the name of that shape. Color in the name with the same color the shape is. For example, the diamond would be colored with a light blue. The following printout is just the opposite. 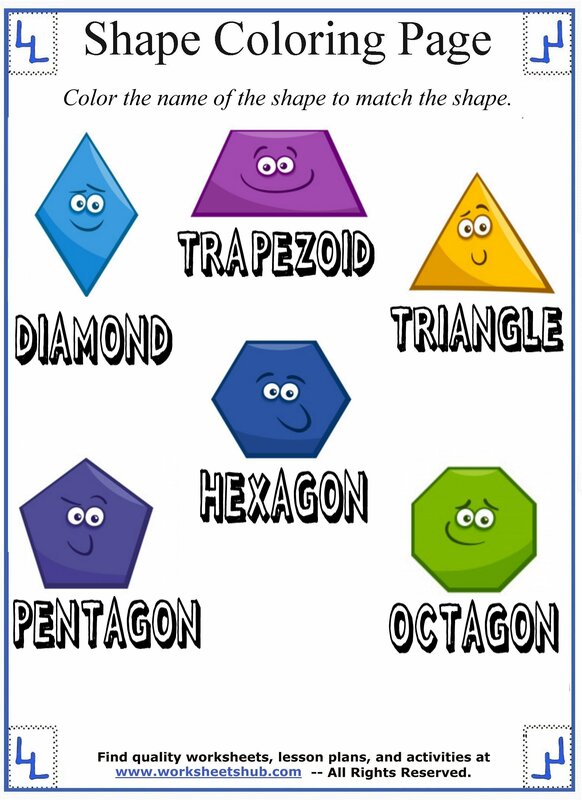 Below each shape is its name. Each name is written in a different color. Color the shape to match the color of the name. The final coloring page features another key code using the advanced shapes. Color in all of the shapes using the guide.